Some years ago, I was taking our chocolate Labrador, Fuzzy, for a walk through Chiswick Park, his all-time favourite haunt. By the lake, set back modestly on the green verge, I noticed a slender tombstone, whose inscription on closer inspection turned out to be in Latin. As a classics don myself, about to hang up my toga, I read the epitaph with some interest, admiring the author’s obvious familiarity with elegiac verse, and found it was a poem in honour of a dog called Lucy. I was struck by how much love was enshrined in these few lines – and how clear a picture emerged of a young dog whose death at the age of eight had almost broken the owner’s heart. How touching it was to read that the animal had possessed ‘all the virtues and none of the vices of humans’ and shown a loyalty without qualification. I found this so moving, that I jotted the poem down. I looked at Fuzzy very differently as we walked home, realising the transience of the bond created between dog and owner and how lucky my family and I were to have such a companion. In due course we lost Fuzzy to a combination of old age and a weak heart, and the house was never quite the same again. A few days later, I came across Lucy’s epitaph in a drawer and decided I would write a similar poem in Latin for our much-loved pet. As a challenge, I used the verse form of Lucy’s epitaph, the elegiac couplet, which had been used by the Greeks and Romans two thousand years ago in epitaphs and also for love poetry. The process was strangely therapeutic, and, on a whim, I typed the final version out with an English translation and showed it to the family. They were all taken with it and claimed to find it very consoling, a proper remembrance of all the happiness Fuzzy had given us. Another friend employed her calligraphy skills, and the result is framed and now part of the house. I have since been encouraged to do this for other friends who have lost pets, including not just dogs and cats, but also a horse. I did the same when our cat had to be put down recently after a stroke. Each time, I ask for details of the pet and try to incorporate these into the poem, making it a personal remembrance. The response, somewhat to my surprise, has been enthusiastic. People have talked about finding the poems consoling and how they like the use of Latin to show respect and dignity. 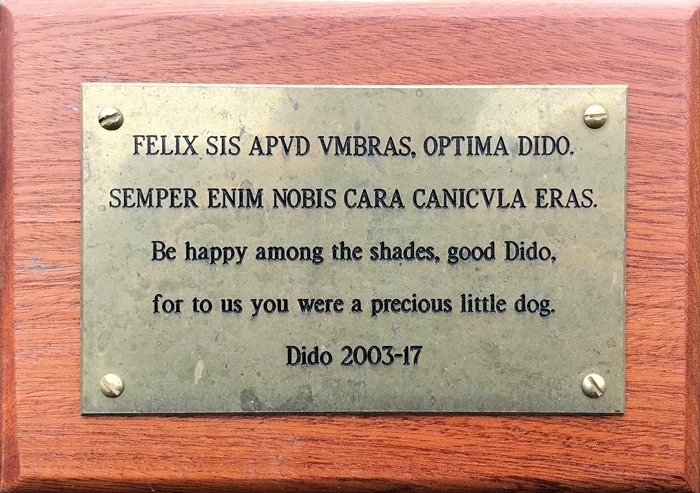 One of my poems is now on a tombstone in the garden of Trinity College, Oxford, commemorating the King Charles Spaniel Dido, belonging to the college’s former president Sir Ivor Roberts. I am thinking of offering to write similar verses for other bereaved pet-owners in the hope that it might make the loss more bearable and also become a way of remembering the animal they lost. My stepson and his partner, Becky, lost their Norfolk Terrier, Russell, a month ago and asked if I would write a poem for them. I asked Becky what qualities she wanted me to record, and what follows went down so well that they want to frame it on the kitchen wall above the place he used to sleep. fuit enim Russell, larum deliciae. magnis et fuscis ardens luminibus. linguam prae se fert et vim vix crederes. nec nimis latrando manes terreas. Weep for my misfortune, all dog lovers. Russell has died, darling of our home. Visit www.deadpetssociety.co.uk to find out more.